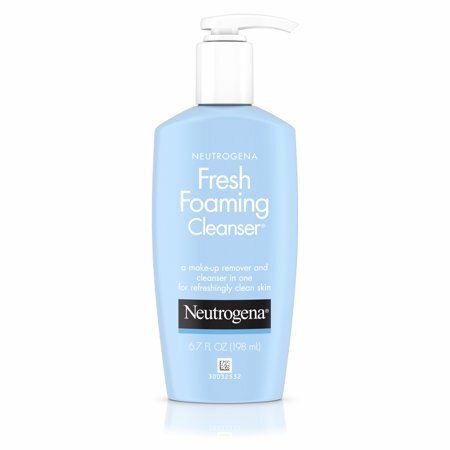 Cleanse and wash away makeup in one easy step with Neutrogena Fresh Foaming Cleanser. Safe for sensitive eyes, this all-in-one makeup remover and facial cleanser helps remove even waterproof eye makeup and leaves skin feeling refreshingly clean. Dermatologist-tested, the daily face wash creates a foamy lather that easily washes away dirt and oil without over-drying skin or stinging and irritating the sensitive eye area. Its gentle oil-, soap- and alcohol-free formula rinses completely clean, with no pore-clogging residue. From a dermatologist-recommended skincare brand, this facial foaming cleanser is hypoallergenic and non-comedogenic, so it won't clog pores. Ingredients: Water, glycerin, lauryl glucoside, decyl glucoside, cocamidopropyl betaine, glycereth-7, ammonium laureth sulfate, sodium cocoyl sarcosinate, glycol stearate, cocamide MEA, PEG-120 methyl glucose dioleate, tetrasodium EDTA, DMDM hydantoin, fragrance. Instructions: Wet face and hands with lukewarm water. Pump cleanser into hands and work into a foamy lather. Massage lather onto face with a gentle, circular motion. Massage around eyes several times until all eye make-up is removed. Rinse with lukewarm water and pat dry with a soft towel. My daughter breaks out easy & has sensitive skin ( just like I did at her age) - she is 12.. this works great- easy to use and doesn't dry out her face or irritate her . My 3 teenage sons have been using this product for 2 years and love the results. After fighting severe acne over the years we have found this product to be amazing!!!!!! I've used this cleanser for years! I've tried others and always come back! It removed my makeup and cleans my face without drying out my skin. I have very sensitive eyes and it easily takes off my eye makeup without irritation! I wish they sold a jumbo refill size!! I would purchase product again. Cleanser removes makeup and is gentle on skin. Really fast shipping.